Issue opens with Rachel feeling bad about Brian being stuck in the timestream. He keeps reaching out to her, and she feels the timestream pulling at her. She has the idea that the solution is to swap places with him but she doesn’t want to give up the life she has grown accustom to. What she should be giving up his this hairstyle she is sporting. It looks like Churchill has given her the look of the back of her head being shaved but with some bangs up top with long hair flowing from the base of her head. It looks so silly. Meanwhile, Moira and Rory Campbell are monitoring Meggan, who is even further into her comastose phase. Shadowcat is also in the room, feeling bad. Meggan also looks more like a demon, she is utterly lost. Rachel comes into the room, Campbell can tell that there is some awkward tension between Meggan and Rachel – he decides that he will learn more about this. Poor Kitty is going through a lot with Illyana’s recent death and having to betray Colossus, so that the X-Men could fix his mental state – so now he can convert back to his human form. Meanwhile, Kurt is checking in on Spoor, a villain with a poisonous power. Spoor wants Kurt to kill him, as he will be killing more. I don’t recall this story, at all. Outside, Rachel is lost in a thought, when Rory shows up. She confides in him about her suspicious about Brian. Gambit 3 of 4 – Gambit goes to Paris! What If 58 – What if the Punisher killed Spider-Man? X-Men 2099 5 – The X-Men go to New York to face Avstarr! 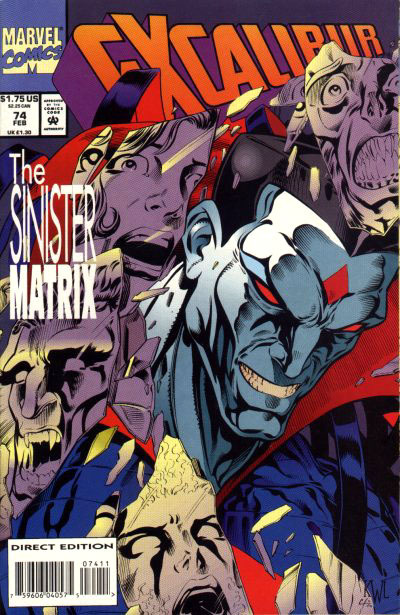 Meanwile, Mister Sinister (from the cover) is talking to the Gamemaster. These are pretty missable three pages – I have never been much of a Sinister fan. Siena Blaze, who is in the room with Sinister, was sent on a mission to get some sweet DNA from Moira’s son. She failed with that task but she did get some of Rachel’s blood. Back with Rachel, she is thinking about Scott and Jean’s upcoming wedding. 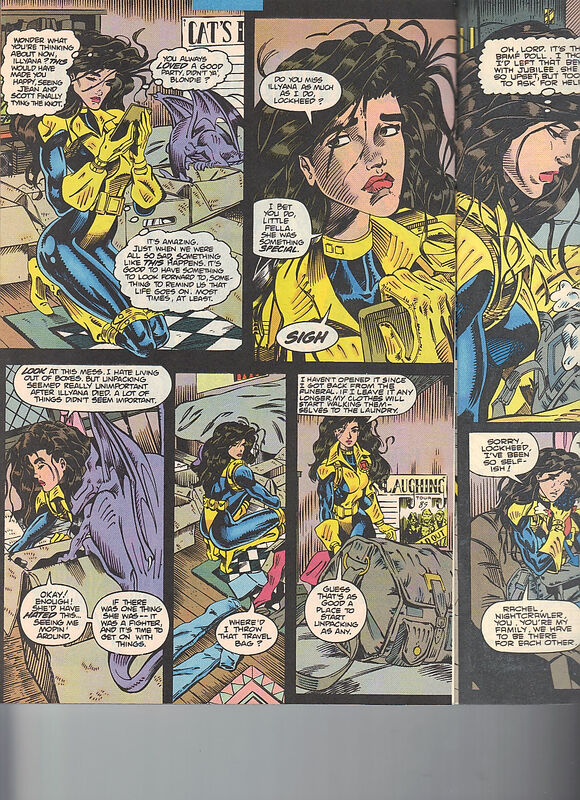 Kurt is in his room, thinking about Cerise as well as slightly teasing the upcoming X-Men Unlimited 4 – as he wants to confront Mystique about his origins. Which I can’t believe that, in 1994, we didn’t know that Mystique is Nightcrawler’s mother. 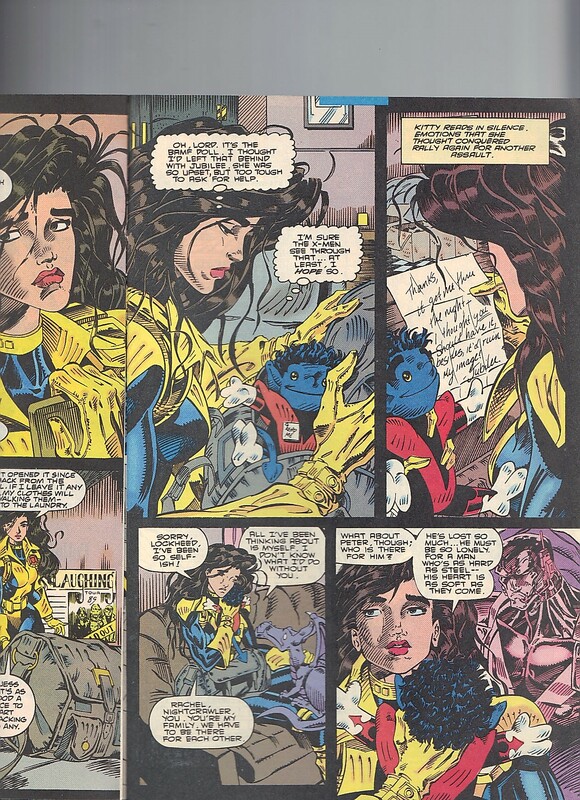 Since we are catching up with characters, we peak in with Kitty and Lockheed. Kitty is sad that Illyana isn’t going to be able to see Jean and Scott’s wedding. Lockheed is poking his head in the boxes. Excalibur is still new to Muir Isle so she hasn’t unpacked yet. She also hasn’t unpacked from her trip to Westchester. Which is awkward timing, that she went for Illyana’s funeral and will have to go back to the wedding but it isn’t like she doesn’t have access to a private plane. It also is helpful that she doesn’t have to answer to a boss, for the additional time off. Churchill draws a pretty nice Lockheed. In Kitty’s bag, the bamf doll that she loaned to Jubilee is back in her bag. Jubilee didn’t need it, after all. Kitty is feeling bad for her betrayal of Colossus but it was for his own good. Plus, he will get over it. Back in the MedLab, Meggan grabs Rachel by her throat – surprising everyone. Meggan knows that it is Rachel who is keeping her separate from her lover, Brian. Rory injects Meggan with a drug, to calm her. Rachel is mad, as he shouldn’t have interfered. Sadly, Lockheed isn’t in the big 75th issue, so the next issue we will review is Excalibur 76.